Seemingly Google are out to get FourSquare. Zagat, the local restaurant guide app that they purchased in September 2011 has got an iOS facelift, and will replace the sandboxed Google plus local. The app is now available on the App Store for download. The Google+ Local app will be discontinued, according to the tech giant. The old app was used to allow users to rate, review, search places by location and share their local discoveries. Google plans to shut down the app by 7 August and to promote Zagat as its replacement. Zagat has a feature set which is remarkably close to that of FourSquare, the rapidly re-emerging social location app which has over 10 million active users. An alternative to Google+ Local is on the horizon, however. Google’s acquisition of Zagat in 2011 offers the perfect alternative to Google+ Local. On Monday Google launched a new app in Apple’s App Store to make Zagat more broadly accessible. Zagat is a restaurant guide of reviews and ratings and has been available on Google Android devices since September 2011. The addition of Zagat for iPhone allows more users to view the expert-selected lists of places to go, along with analysis, menus, how-to videos and even chef interviews. Zagat is truly a foody’s paradise and is set to find favour amongst scores of FourSquare fans, many of whom use that service to hunt out the best local places to eat and drink. Zagat is looking to take the food element of social discovery to a new level, as illustrated by the apps partnership with Open Tablet. This means that when users find a restaurant they like, Zagat even links them to Open Table to make a reservation. Its a sleak and sure to be highly appreciated, update to the standard discovery process, and should ensure that Zagat drives plenty of people to local businesses. 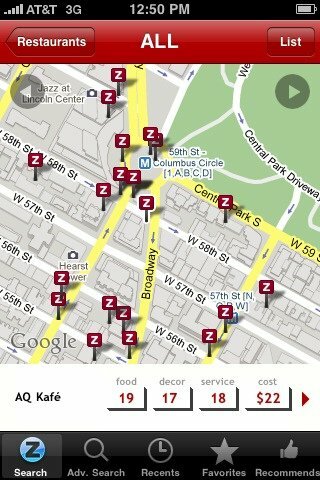 You can now download Zagat from the App Store for free; it’s optimized for iPhone 5.